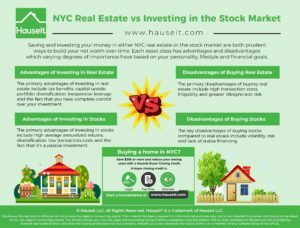 Saving and investing your money in either NYC real estate or the stock market are both prudent ways to build your net worth over time. More often than not, there’s no clear answer to whether it’s worth investing in real estate vs. stocks. This is because each asset class has advantages and disadvantages which have varying degrees of importance based on your personality, lifestyle and financial goals. The best strategy for growing your net worth over time is to defer as much consumption as possible so you can grow and invest your savings. In an ideal world, you should have a diversified portfolio which contains both real estate and stocks. What Are the Advantages of Investing in Real Estate? What Are the Disadvantages of Buying Real Estate? What Are the Advantages of Investing in Stocks? What Are the Disadvantages of Buying Stocks? Investing in real estate can be incredibly lucrative if you’re aware of and willing to take advantage of all the tax benefits on offer. Real estate offers tax benefits to both investors as well those who use their homes as a residence. If you’re buying an apartment to live in, you’ll be able to pocket up to $500,000 in tax-free capital gains when selling if the property has been your primary residence for two out of the past five years. The exemption is $500,000 if you’re married filing jointly and $250,000 for single filers. In NYC, you can also apply for a property tax abatement if you use your home as a primary residence. We explain everything about NYC real estate taxes in this article. Real estate has appreciated significantly over the past 30 years. You’ve probably heard of someone, either a family member or a friend, who paid virtually nothing for a property years ago and then sold it for multiples of what they paid for it. While some amount of these massive gains are attributable to inflation, it’s true that real estate has been a great place to invest money over the past few decades. If you’re wasting money on rent each month, there’s a strong argument to be made that it’s better for you to buy a property so you can benefit from capital appreciation. Although real estate has appreciated significantly over the past few decades, so has the stock market. 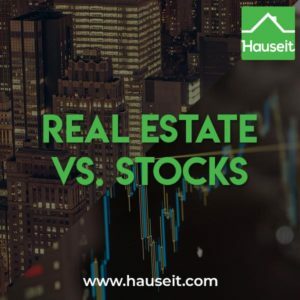 It’s generally understood that stocks provide a higher annualized rate of return compared to real estate, especially when you factor in their lower transaction costs and exclude the tax benefits of owning real estate. With that said, buying the right property and the right time can offer you far more upside than the stock market. This is in part because you have complete control over you real estate asset, meaning you have the ability to make capital improvements, raise rents and utilize tax benefits. The stock market is completely passive in the sense that you have essentially no control over how the companies you invest in manage their businesses. Owning real estate also provides your portfolio with the benefit of owning a physical asset. In an increasingly volatile and interconnected world, having a tangible asset can have a stabilizing effect on your finances during inflationary periods and bouts of stock market turbulence. While the value of real estate obviously falls during recessionary periods, you only see a loss if you sell during this time. If your 401K and brokerage account are down 20% in a year, it’s a nice feeling to own a valuable, physical asset whose value isn’t marked to market each day. If you own an investment property during a market downturn, you will likely still generate rental income each month even if the stocks you own have suspended or reduced their dividends. Buying real estate is the typically only opportunity for an individual to borrow a substantial amount of money at a low interest rate. Leverage on real estate is especially lucrative because it is not marked to market, and this means that your leverage won’t go away in periods of market turbulence. Contrast this taking out leverage on a stock investment which is marked to market. If the market falls and your portfolio is leveraged, you’ll need to put up additional margin or be forced to sell your assets during a time of depressed values. The combination of inexpensive leverage and potential tax benefits makes buying real estate an attractive proposition for most people. Owning real estate is a more active investment compared to the stock market. The benefit of real estate is that the additional control you have over your asset gives you the ability to add value and maximize the potential of your real estate holdings. For example, let’s say you own a rental property. You have complete control over what improvements to make, which contractor to hire, how much rent to charge your tenant and when you decide to sell. As a stock investor, you essentially have zero control or input over how these companies invest and strategize. The primary disadvantages of buying real estate include high transaction costs, illiquidity and greater idiosyncratic risk. Buying and real estate is very costly due to high buyer and seller closing costs, especially in NYC. Whereas with stocks you can make a five or low six figure investment and pay just a few dollars in fees, for real estate your buyer closing costs are at least 1% to 2% for a co-op or 4% or more for a condo or a house. Because of the high closing costs, real estate is only a worthwhile investment if you plan on holding onto your property for an adequate amount of time. Buying and selling every few years will erode most if not all of the gains you’ve accumulated from owning real estate in the first place. Real estate is an illiquid asset which means it is both time consuming and costly to buy and sell. Whereas with stocks you can sell and receive the money in a matter of days, for real estate it can take six months or more to complete the sale process and receive your sale proceeds. If you’re in the unfortunate situation of having to sell in a buyer’s market, the sale process could take a very long time and you might not be happy with the outcome in terms of the sale price. Stocks fall as much if not more than real estate during a recession, but at least you’re able to generate cash quickly if you need to sell. Owning real estate carries a great deal of idiosyncratic risk (non systemic) which you simply cannot hedge against. For example, you are completely out of luck if there’s a natural disaster or your tenant stops paying you and doesn’t move out. Contrast this with stock market holdings, whereby you are so diversified such that there would never be a scenario where 100% of your investment is paralyzed or substantially impaired. The law of large numbers and diversification with a balanced stock portfolio means that the only risk you take is market-wide risk (also called market beta). The primary advantages of investing in stocks include high average annualized returns, diversification, low transaction costs and the fact that it’s a passive investment. The average annual return for the stock market is 7% to 10% depending on who you ask, what your time period is and which indices you’re looking at. It’s generally understood that the annualized returns for stocks have been higher than for real estate over the past few decades. The stock market’s high average annual returns look even better when you consider that stock investing is a passive activity which does not require any of the time drain or idiosyncratic risk you face when dealing with physical real estate. Investing in the stock market is one of the most efficient ways to eliminate idiosyncratic risk and build a diversified portfolio. If you buy index funds or ETFs, the only risk you face is general market risk (market beta) as opposed to the risk of individual stocks or assets. Buying real estate, on the other hand, presents you with a large amount of concentrated idiosyncratic risk. This is because you’re fully at risk if and when something goes wrong with your property. If there’s a natural disaster or your tenant stops paying rent, it could take you years or months to restore your property and continue receiving rent again. Buying stocks is one of the most inexpensive ways to invest money, especially when compared to real estate. While buying a condo in NYC will cost you ~4% in closing costs on average, investing that same down payment in stocks may only cost you a few dollars in transaction fees. That’s just a fraction of a fraction of a percent! In addition to low transaction costs, stock market investments are also very liquid. This means that you can easily sell some or all of your investment and raise cash in a matter of days. When it comes to real estate, even the quickest all-cash sale can still take 4 weeks or more to close. The average time it takes to sell a co-op in NYC from start to finish can take six months or more. 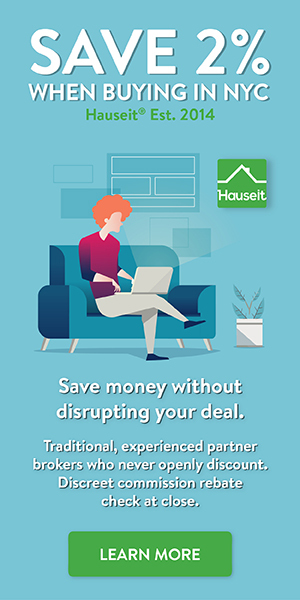 Once you’re in contract with a buyer, it still takes another two to three months on average to complete the board application process and receive the clear to close. Stock market investing is totally passive in the sense that you do not need to invest any time principally managing the strategy or operations of any of the companies you’ve invested in. This is the complete opposite for a real estate investment, where you are essentially in the driver’s seat when it comes to managing your own investment. Simply buying the index using a low-fee or no-fee ETF will give you the average market return and eliminate idiosyncratic risk without costing you any time, headache or hassle. The key disadvantages of buying stocks compared to real estate include volatility, risk and lack of stable financing. The stock market is much more volatile than real estate because of the fact that stocks are traded on a daily basis. This means that the market value of stocks fluctuates day in and day out. The sticker shock of seeing stock prices fall during a selloff can be highly troubling, especially when compared to relative calm of a property whose value doesn’t fluctuate on a daily basis. Both stocks and real estate values fall during a recession, however it’s less noticeable for real estate since it is an illiquid asset class which is not frequently bought and sold. The greater volatility of stocks is one reason why it’s harder to obtain leverage (financing) with stock holdings when compared to real estate assets. Investing in stocks can be risky, especially if you buy individual stocks as opposed to the market index or other sector ETFs or Mutual Funds. If your portfolio is heavily dependent on one or two stocks and they experience trouble, you could end up losing money overall instead of earning the average annualized market return if you had simply purchased index funds. Being overinvested in one particular stock will induce idiosyncratic risk into your portfolio. If the company experiences falling earnings, a scandal, massive litigation or the loss of a CEO, your stock holding could fall drastically even if the rest of the market is performing just fine. It’s typically very costly to obtain leverage for stock investments due to the volatility of the market. Most financing for stocks is marked-to-market which means that you may have to put up additional collateral when the market is falling. Otherwise, the financing will be taken away and you’ll be forced to sell your stocks at depressed prices. Even though annualized stock returns are usually higher than for real estate, with real estate you can take out a large mortgage at a reasonably low interest rate. For the right real estate purchase, this leverage can easily outweigh any benefits of higher average annualized returns for stocks. Buying an apartment in NYC can be a very good idea if you are currently renting and have enough savings for a down payment. There are a number of advantages to buying which include leverage, tax benefits, capital upside and greater quality of life. With that said, it’s important to buy the right apartment, as not all apartments in NYC are good investments. If you’ve been renting in NYC for a few years, chances are that you’ve saved up enough money to cover the down payment on a co-op apartment. Many renters believe that it’s more appropriate to continue renting and invest their savings in the stock market instead. While it’s true that stock market returns are typically higher, this analysis ignores the fact that you can take out a large amount of leverage when buying an apartment. Let’s say your down payment is $200k. You can either invest $200k in the stock market or invest $1,000,000 in real estate (using an 80% loan). Even if the annualized return is higher for stocks, you will have more capital upside with the real estate investment since you are putting more money to work, so to speak. Furthermore, owning real estate will give you a number of tax benefits including a capital gains exclusion if you sell your primary residence or the ability to take large deductions if you’re using real estate as a rental property. Buying instead of renting can also be advantageous from a quality of life perspective. This is because living in a property you own feels much more stable than renting and having to worry about a lease renewal or moving out each year. Furthermore, as an owner you’ll be able to add value to your real estate asset by making renovations over time. After all, who doesn’t want to own an apartment or a brownstone in New York City? Pro Tip: Have you ever wondered how long a seller has to accept an offer? Learn more in this article.